and His Dog Teddy" - which included the smash hit version of the Jerry Jeff Walker song "Mr.
year's landmark album, Will the Circle Be Unbroken. ability to successfully bridge the gap between contemporary and traditional music. studio in the near future. musical thread has remained the significant core of our music." Chris Darrow, and Eagles/Flying Burrito Brothers member Bernie Leadon, among others. 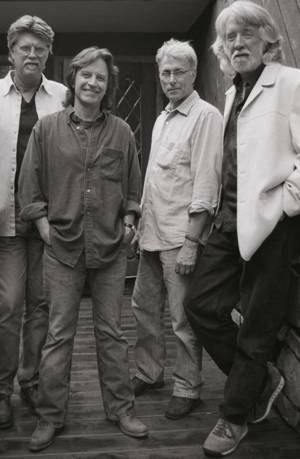 simply "the Dirt Band," the group's name was restored to its full length, and its focus to country music. “Dance Little Jean” and including the No. 1 hits "Long Hard Road (The Sharecropper's Dream)"
Emmylou Harris, Lyle Lovett, Rodney Crowell, and Steve Earle on the airwaves. natural part of the popular musical cycle. "I think Americans have a real sense of history and looking at music in that context is great," he says. whole, can only benefit from it." were enlisted for the sessions. "It was a terrific time that was too brief," Hanna says of those six days spent recording in Nashville. "But it was great... Every day was like Christmas." country performance by a duo or group with vocal. "Acoustic" and 1999's "Bang Bang Bang."